One day closer. Those three words are comfort right now as the seconds tick away toward the start of the Colorado Rockies opening spring training in Scottsdale, Ariz.
Perhaps like you, we’re looking for any news about the Colorado Rockies we can find to help us pass the days. With that in mind, here are three articles that we came across that we think will help fill the baseball void for you as you begin your Wednesday. Daniel Descalso did almost everything for the Colorado Rockies last season. In 2017, however, the Rockies will see the veteran utilityman a whole lot more on the other side of the diamond. On Tuesday, the Arizona Diamondbacks signed Descalso to a one-year contract. It marks the third former Colorado player from 2016 who has signed with another squad, joining Nick Hundley heading to San Francisco and Boone Logan inking with the Cleveland Indians. Versatility was one of the great things that Descalso brought to the Rockies last season and that legacy was apparent in the signings of Alexi Amarista and Ian Desmond, both of whom can play multiple positions. 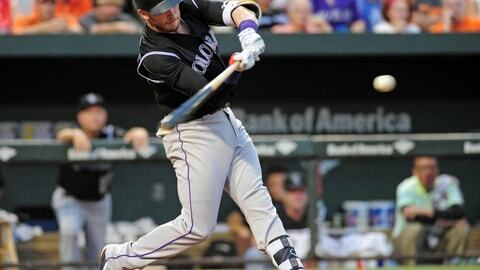 The Rockies signed Chris Denorfia to a minor league contract and invited him to spring training. Now, the 36-year-old veteran is proving that his best days are far from behind him. In this article by MLB.com’s Thomas Harding, Denorfia discusses how gymnastics have helped him get past years of back pain. “The whole philosophy behind it beyond the physical strength is the mental strength to do some things,” said Denorfia, who had no gymnastics training previously. “It really appealed to me. I didn’t enjoy going to the gym anymore. I’d been doing it for so long. So I lifted weights one time a week all offseason, and I saw better results physically doing the gymnastics things, the high-mobility stuff. The Rockies need Trevor Story to be healthy in 2017, and the second-year shortstop wants the exact same thing. A thumb injury cost Story much of the second half of last season. It also put a dent in Colorado’s run toward a potential Wild Card berth. In this article, Patrick Saunders of The Denver Post talks about Story’s return and what it could mean for the Rockies.